ACT Fibernet launched 1 Gigabit per second wired broadband internet service in Hyderabad, the first player in the Indian market to offer such a high speed for an entire city. ACT Fibernet, which claims to be the largest non-telco internet service provider (ISP), uses fiber optic technology, and its 1 Gbps offering is 400 times faster than the average internet speed of 2.5 megabits per second in India. Gigabit speeds, will allow downloads from the internet faster than transferring data from a USB drive, and will be available for Rs 5,999 per month. “With our citizens and the government moving towards the Digital India movement, high speed internet is the need of the hour. With the launch of our 1 Gbps broadband internet service, it gives me immense pride to turn this dream into reality," said Bala Malladi, CEO, ACT Fibernet . ACT Fibernet’s 1 Gbps wired internet service would soon be available in the 11 cities the company has presence in. Airtel has recently launched 40 MBPS broad band plans. Existing 16Mbps customers will get 40MBPS if they change their modem to VDSL. This is different from Fiber plans. I am using this plan for some time now and here is a small review of it. 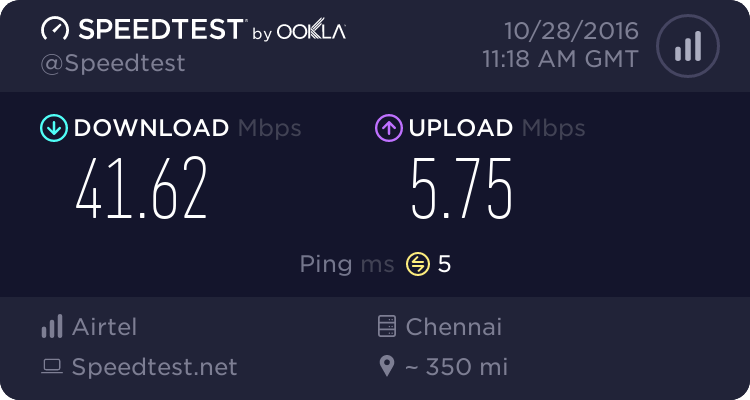 When I check speed on Airtel Server then I get [url=http://www.speedtest.net/my-result/5752436103] [/url] I am getting little more than the promised 40 MBPs. Some times it goes till 42 MBPS ::) All plans are 40MBPs and tariff starts from Rs.999 with 50 GB FUP with no free calls and from plans starting from 1099rs we get unlimited calls both local and std. 75 GB FUP Rs.1099 100 GB FUP Rs.1299 125 GB FUP Rs.1499 200 GB FUP Rs.1999 For new customers, get Unlimited internet free for 3 months on Rs.1099 and above plans. Reliance Jio begins 4g sim delivery in Kerala circle.